The long established and well known brand name ‘Demag’ is one of the best respected within the lifting gear industry. (now part of the Terex group, and re-branded – Terex Demag ). A Demag hoist is very reliable and quite compact, yet robust enough to complete most lifting and manoeuvring tasks within most workplace situations. Lifting Hoists Direct can not only supply you a Demag hoist but we can offer service and maintenance packages too. We can get Demag hoist parts and offer repairs and thorough inspections complete with all the necessary documentation you will need for your records. A Terex Demag hoist could be the answer to your material handling issues. There is a range of 6 Demag hoists available to suit a wide variety of lifting applications. There are various types of suspension points and a range of trolley systems available to further compliment your Demag electric hoist. Demag hoists also manufacture the Manulift which is the perfect accompaniment to any workbench. The Manulift enables you to lift, lower and move loads and tools with great precision on and around your working area. If you need an electric hoist for use in a wind turbine, Terex Demag has the solution with the DC-wind electric hoist. This relatively new Demag electric chain hoist will work well with the majority of wind turbines. 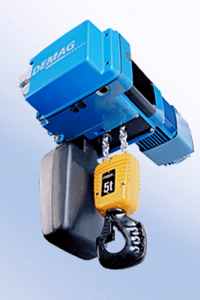 Demag hoists are using innovative means to expand their range of compact electric hoisting systems. These systems now include synchronised double chain hoists, and quad chain hoists. 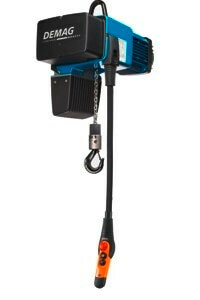 They also include a speed hoist and a low headroom travelling hoist. Whatever your lifting task requirements, the chances are that there is a Demag electric hoist model perfectly suited to your needs. Whether it is a simple, standard lifting operation using a more common place, hoisting system on a crane or overhead beam; a bench/tool handling hoist for precision work or for the smooth operation of a wind turbine, a powered Demag chain hoist could be the answer.